As the season of 'mists and mellow fruitfulness' begins to gently envelop the land it's time to enjoy a fungal foray around my local fields. 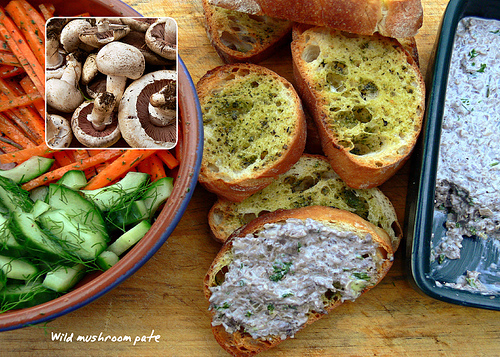 Luckily I came across a field peppered with field mushrooms, so many in fact, I decided to make a pate from the excess. In a large pan, melt the butter over medium-high heat. Add the shallots and garlic and cook, stirring, until soft and fragrant, 2 to 3 minutes. Add the mushrooms and cook, stirring, until wilted and starting to brown. Add the wine, thyme, rosemary, soysauce, salt, and pepper, and cook, stirring, until the wine is nearly all evaporated, 5 minutes. Add lots of parsley and cook for 30 seconds. Transfer to a food processor. Process with the cheese until well combined. Adjust seasoning, to taste. Transfer to a dish or bowl, cover and refrigerate until set, 3 to 4 hours. Serve chilled.